I wonder if there are some birds in city parks or that live near garbage dumps that live exclusively off of human food. Would they even know what to do with a worm? Do they shun the bush full of fresh berries? Also, if you have read through the archives recently you may have noticed that I stole the concept for this joke from myself! Birds cannot get nutrition from human food. So they’d all eventually die off. Reviving an old thread to clarify something for other time travelers: isn’t quite that dire. Birds *can* get nutrition—calories for energy, protein, vitamins, etc.—from human food. What might give them trouble is trying to have a balanced diet made of human food. 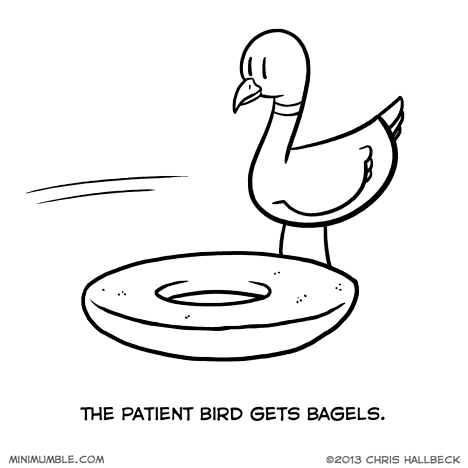 A bagel or some crackers could fill a bird’s stomach for an entire day, and then it wouldn’t get any variety. There is, they’re called seagulls. They seem to be able to live off pretty much anything. The birds/ducks at Disneyland seem to live off of human food. We have a department to provide them with proper food, but I’ve never seen the feeders, so I don’t know how many of the birds actually use them. And I still find myself chasing birds off of popcorn spills so I can sweep them. Does that include Donald Duck? That would seriously mess with some kid’s head right there. Donald Duck certainly lives off of human food. But I don’t have to chase him off of popcorn spills. He doesn’t spend more time onstage than he has to. His feathers make him very warm, so he needs to take a lot of breaks to cool off.